We are happy to share with you the amazing December-only Cherry deals, so please check it out and make sure you don't miss out! 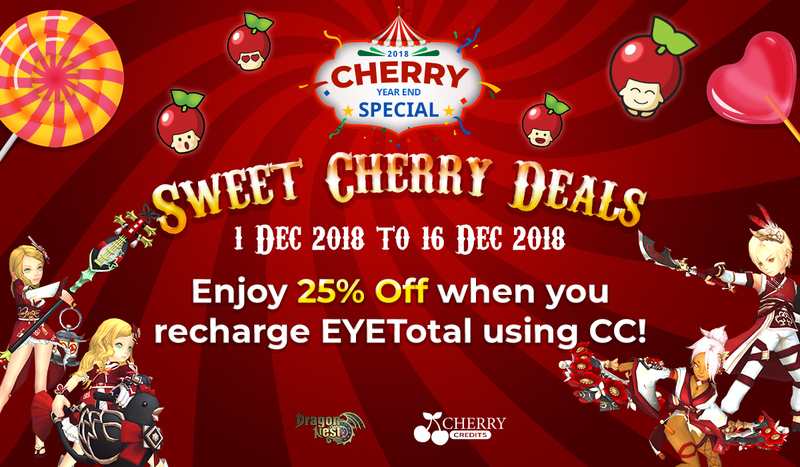 Enjoy 25% discount when you recharge your EYETotal with CC from 1 Dec 2018 to 16 Dec 2018 2359HRS (GMT+8)! Also, not to miss other superb deals from Cherry Credits in this Cherry 2018 Year End Special ! Deals include discounts, rebates and bonuses offers, top-up vouchers lucky spin, spend and sure-win lucky dip, weekend flash sales and year end lucky draw, it’s a party for everyone! Enjoy 25% discount when you recharge your EYETotal with CC! Not to miss also, up to 80% discounts, rebates and bonuses for other game titles! From 17 Dec 2018 to 31 Dec 2359HRS (GMT+8), receive 1x Sure-Win Cherry Dip chance with every 10,000 CC spent in a single transaction. Prizes include jaw-dropping 500,000 CC, Explosion BS (Beelzebub Special Edition) Mount, Lagendia Gacha Package, 7-color Rainbow Wings and more premium in-game prizes from Dragon Nest SEA and other game titles! Look out for the promo code in our Cherry emailer and official Facebook page and use it to participate in our Spin and Win event! As much as $20 top-up vouchers for grabs – everyone will win something for sure! From 1 Dec 2018 to 31 Dec 2018 2359HRS (GMT+8), every 10,000 CC top-up in a single transaction grants you a chance in our Cherry Year End Draw with lots of cool prizes to be won!